We went to a slightly baffling fundraiser for an animal shelter back in February. We were quite put out by the steep entrance fee, but then it turned out that you just paid what you wanted for all of the food, so it made more sense to try to sting people on the door. There wasn’t an abundance of food, but we did pretty well. First of all we tried these corn dogs. Neither Dr HH nor I had ever had such a thing before, so I can’t comment on its authenticity, but it was nice and novel. We also got a couple of cakes to share. The collapsed one on the left is the traditional Czech molehill cake, slightly deconstructed: it’s chocolate sponge, banana and lots of cream. Even when it’s messy, it’s very good. 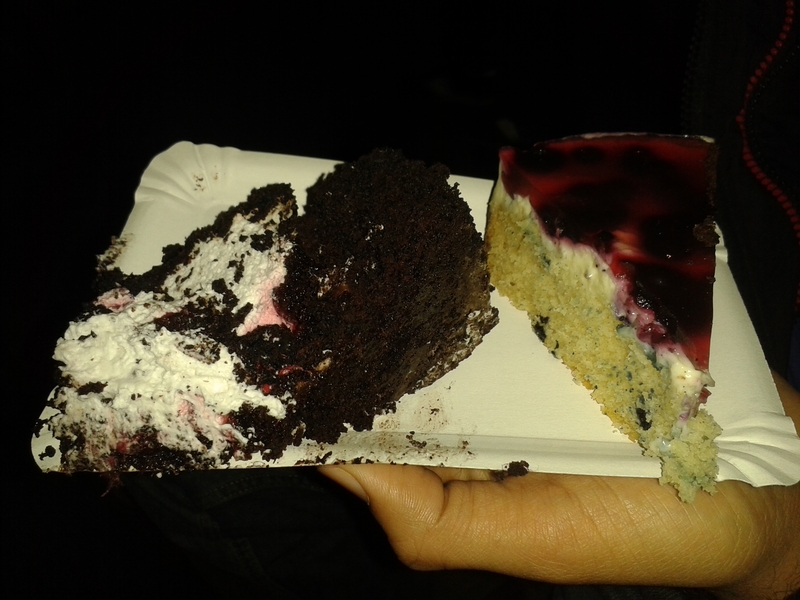 When we chose the cake on the right, we could only see the top and assumed it was a cheesecake. 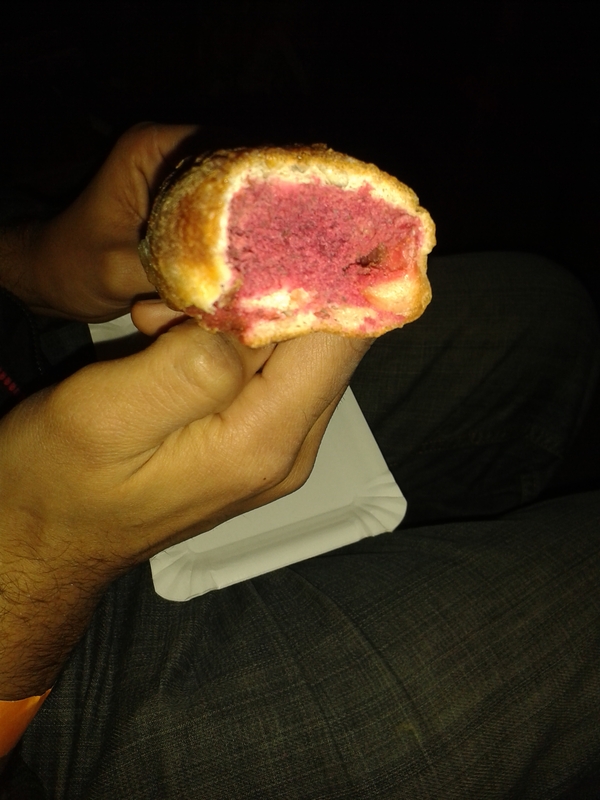 Although I was initially a bit disappointed by the sponge, it turned out to be absolutely amazing. We loved it! With the warmer weather came the outdoor festivals! This was the Veggie Naplavka festival by the river in May. We had some burgers, which were good and hearty. 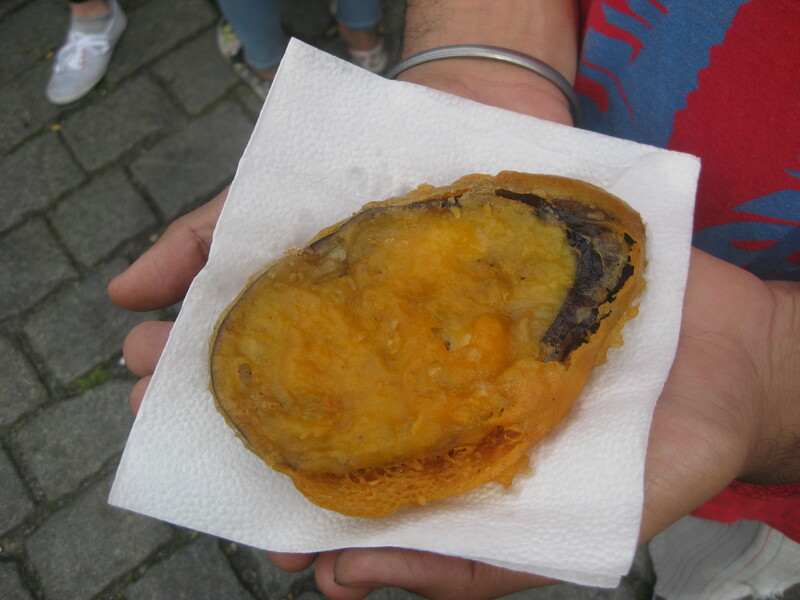 Dr HH can never resist the opportunity at these events to grab something deep-fried from one of the Loving Hut stands – this time, he went for aubergine. 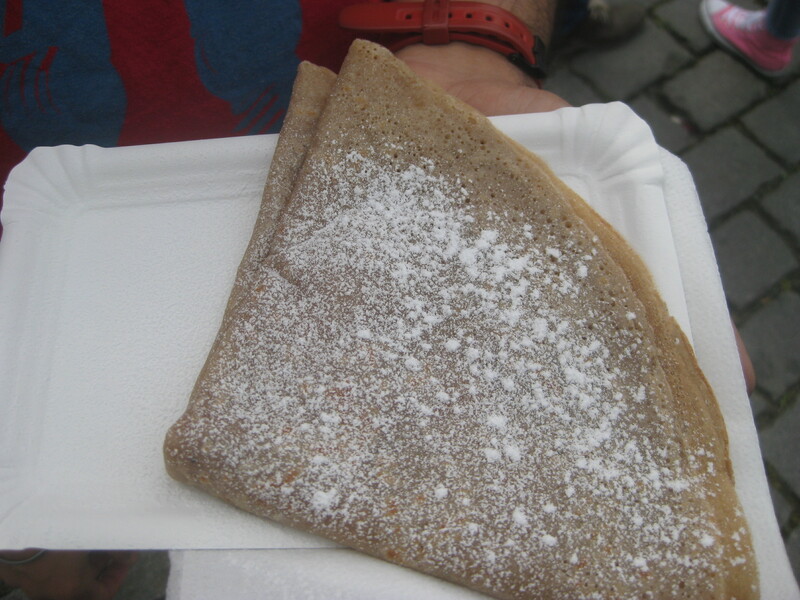 For dessert, we got some crepes! It was fun to see these being made. There was a choice of compotes – we copied the Czechs and got some apricot jam. 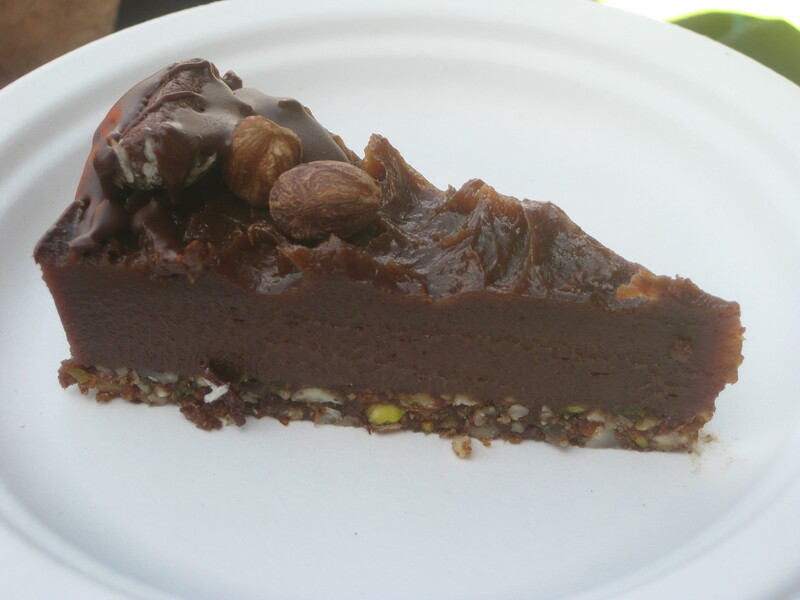 And a slice of cake from Momo, a vegan and gluten-free cafe. 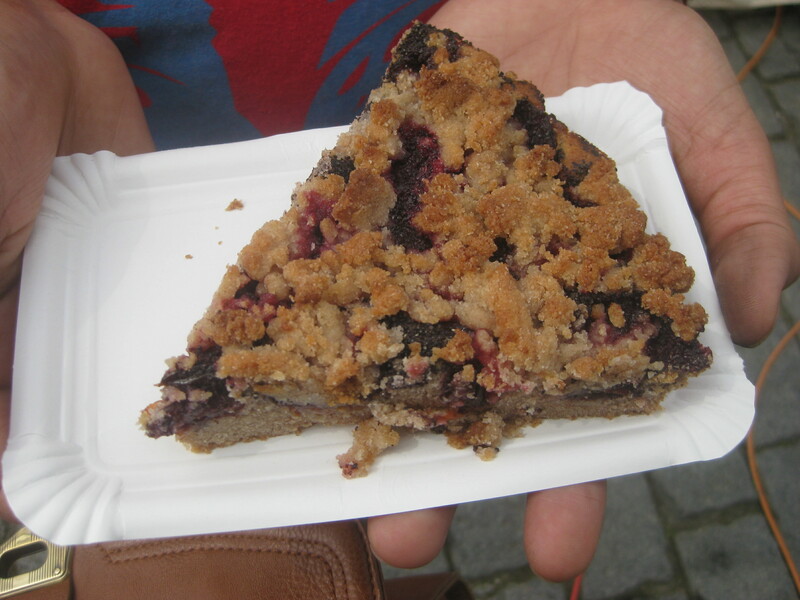 Alas, the crumble on top was quite soft, but it was still a good fruity slice. 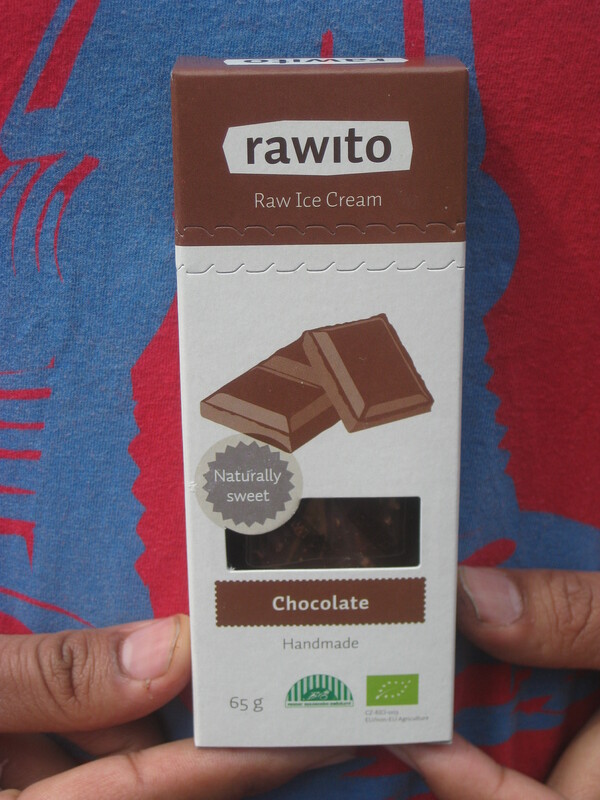 We also got this ice cream for the road. 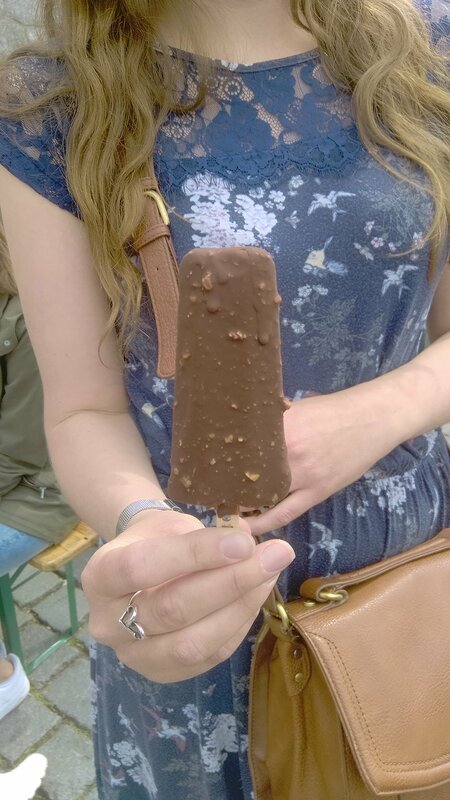 I was hoping it would have a good solid chocolate core like a Feast, but alas no – it was still pretty exiting. There was another Veggie Naplavka on the last Sunday in August, with all the same caterers, I believe, but we resolved to have different food this time. 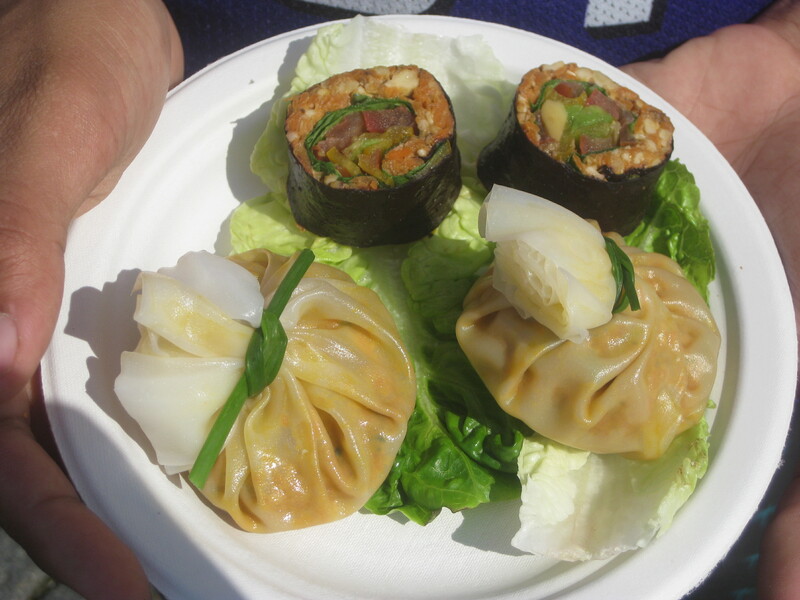 As it was a boiling hot day, we started with some raw bites from My Raw Deli: good flavoursome sushi, and exciting dumplings (we had these at the festival last September too). But then we moved on to the serious business! Dr HH enjoyed this enormous hotdog from Leo269. 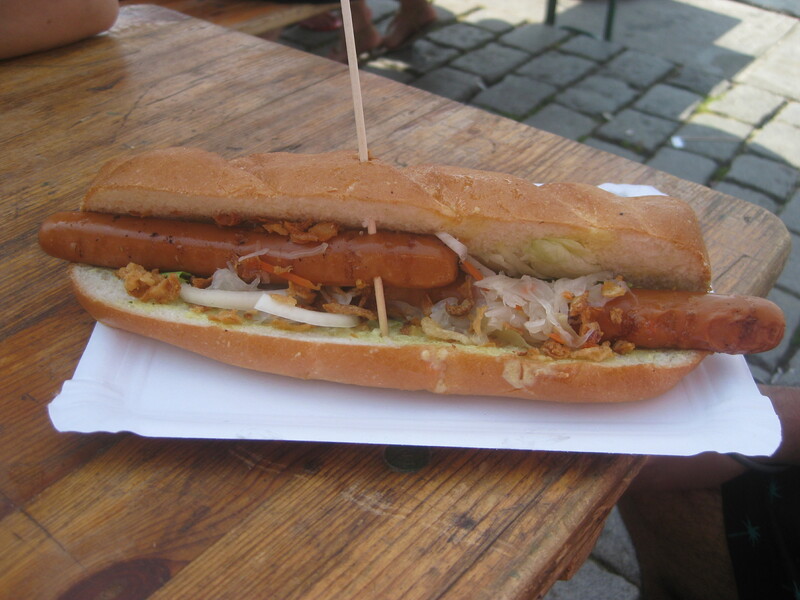 It was basically a baguette filled with two sausages, some salad and crispy onions. What’s not to love?! Somehow, he also had room for this fried good from Mr Hau. 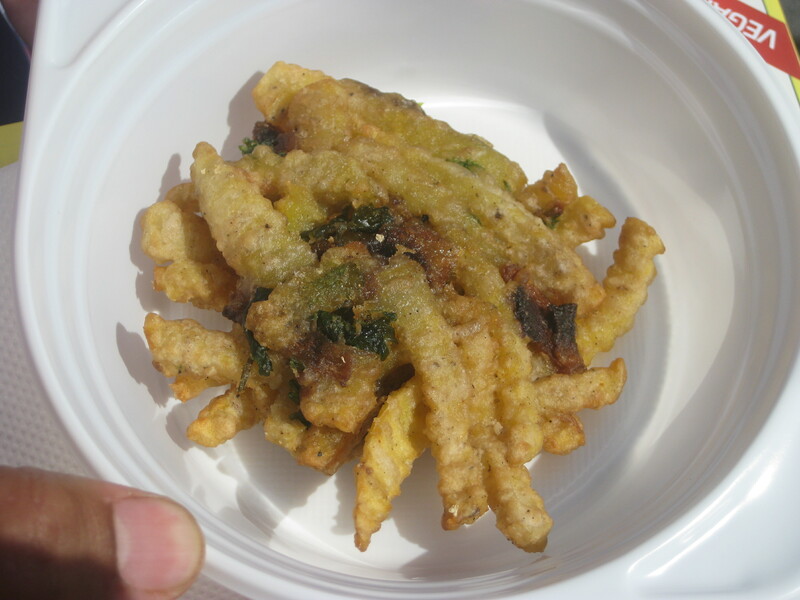 It looked (and tasted) like someone had made some chips, then deep-fried them into a patty. You definitely couldn’t eat more than one of these! 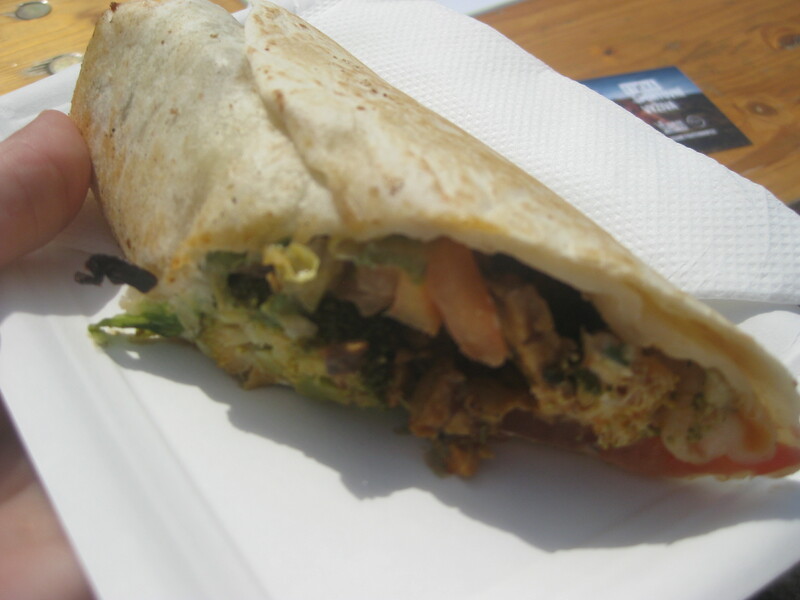 I went for a somewhat lighter lunch, with this tempeh wrap from one of my favourite restaurants, Plevel. It was smoky, creamy and delicious! And finally, we returned to My Raw Deli for some cake. There were about six different kinds and they all looked incredibly inviting, but we went for this chocolate and hazelnut one. It was well-flavoured and really sticky from the dates: a definite winner! …and followed up with more sushi, this time from Loving Hut. Oh, and a greasy, delicious potato cake, because who only wants to eat raw, healthy food?! We shared a few desserts as well. 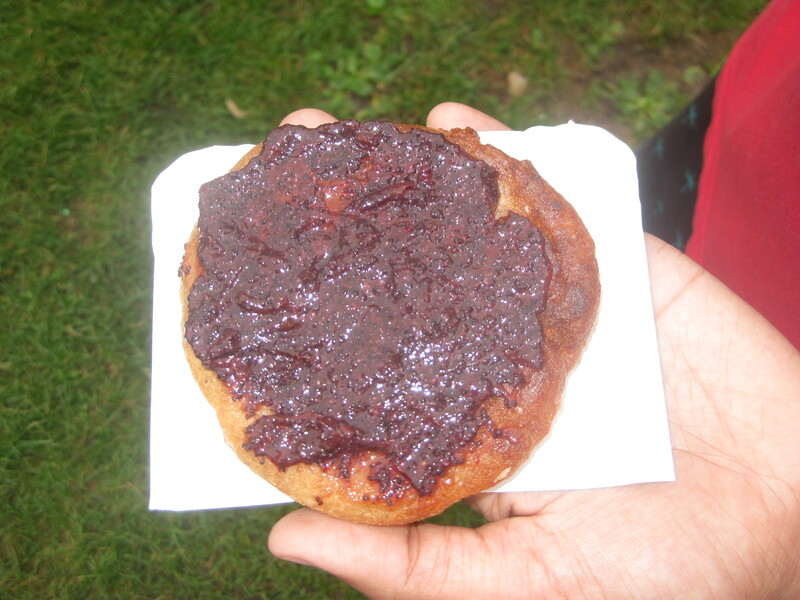 This was kind of doughnut-esque, spread with plum and poppy seed jam. Czechs love a good poppy seed, and it gave a really nice texture to the dish. 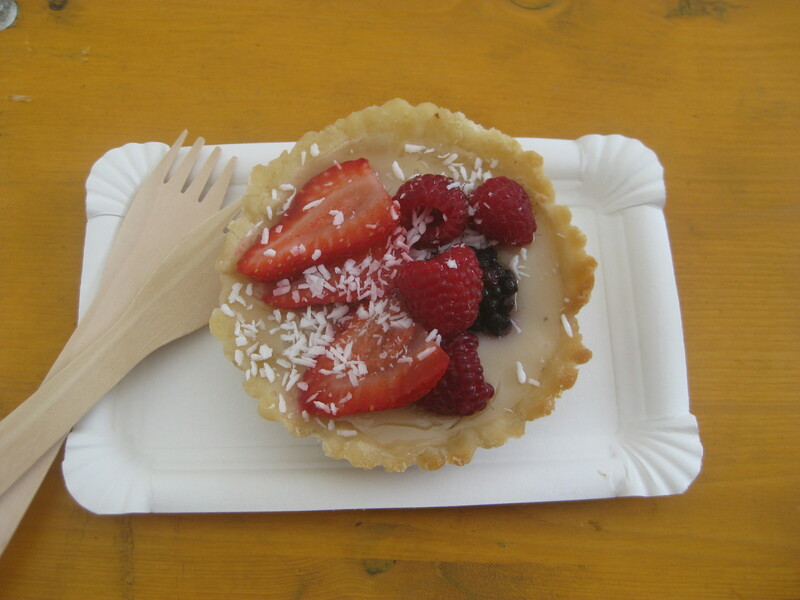 This elegant little tart was from Momo again. It was nice, and there was some sweetness from the fruit and coconut, but I felt a little extra sweetness would have been nice (all their goods are sugar-free). And maybe the crust would have been better if it had some gluten. 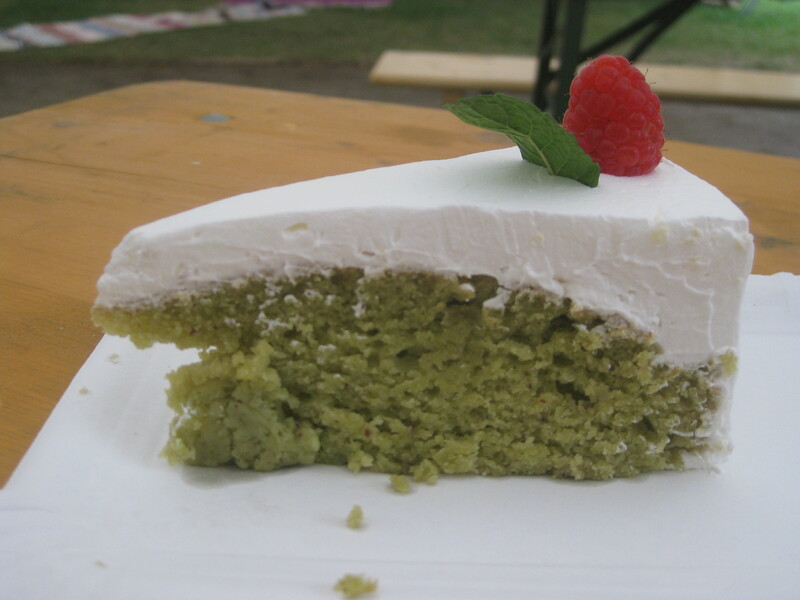 This green tea cake from Loving Hut was subtly flavoured, and so light and delicious. It tasted as good as it looked, and the creamy topping was spot on. Now as we’re settling in for autumn and winter, festival season might be over. Hopefully we’ll sneak a few more in next year though! 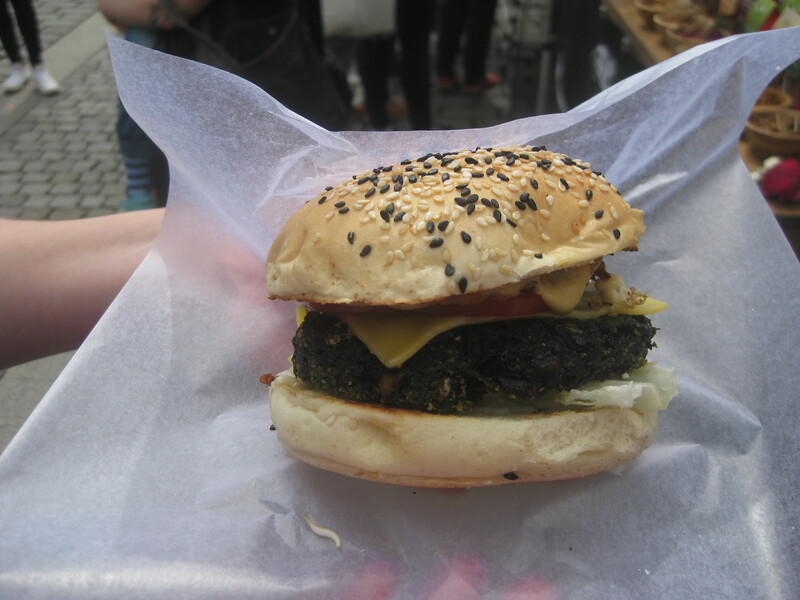 This entry was posted in Travel and tagged vegan festivals Prague, vegan Prague, vegan travel. Bookmark the permalink. 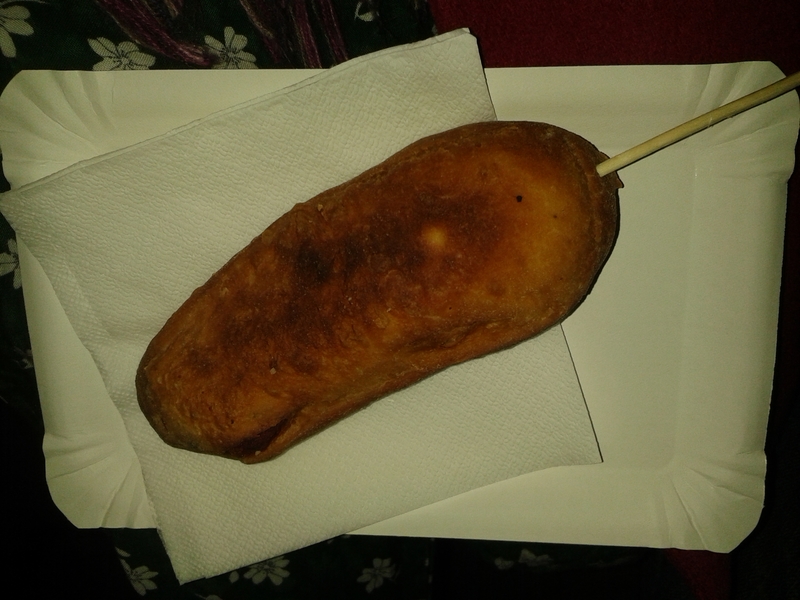 A corn dog?! Lucky you! I remember loving the vegetarian ones I could find in the frozen section, but I haven’t been able to find a vegan one. I am sure there are vegan shops out there that make them, but I haven’t seen any yet. As soon as I saw that green tea cake, I had to have it! It’s not a flavour I have often either, but it’s nice to try something different. I don’t actually know what a corn dog is but I want to try one now. 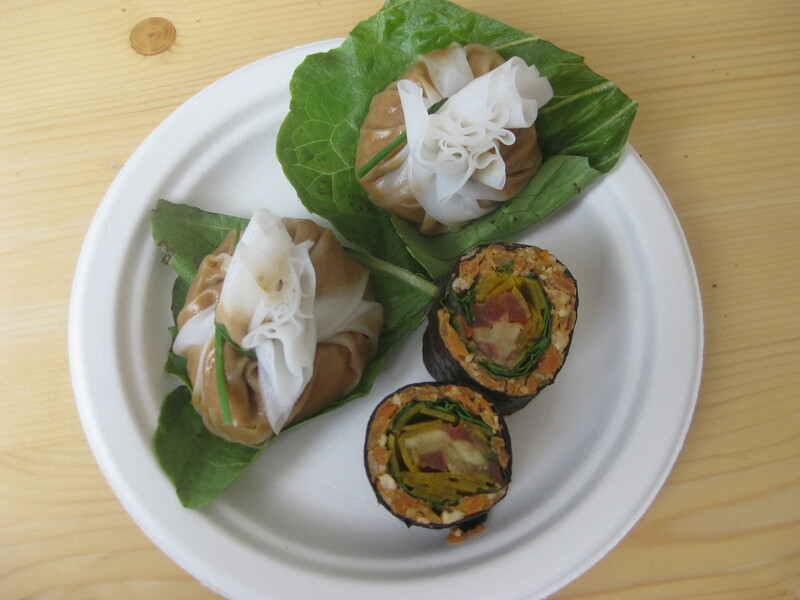 That is so great to see how well vegans are catered for in Prague and so many festivals too! I expected it to be like a hot dog, but I remember the whole thing was surprisingly soft. It was exciting to try one! Wow, there are so many cool festivals in Prague! 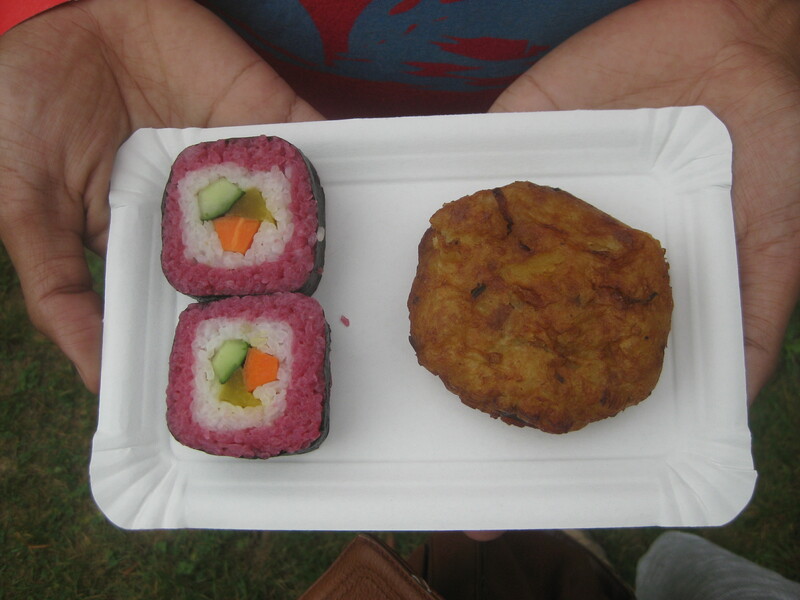 The amazing sponge cake and the deep fried aubergine look particularly epic. Yes, we’re very lucky! There’s going to be another one in December. It’ll be my first festive vegfest!